This restaurant-quality recipe is the perfect cold dish salad for the warm months! Bring water to a boil and add the Rotini pasta and cook according to package directions. Rinse under cold running water and drain well. Stir the tomato juice, olive oil, vinegar, chili powder, paprika, salt and black pepper together. Toss it with the drained pasta and refrigerate for 2 to 4 hours. Combine the Parmesan cheese, corn kernels, cilantro, scallions, red bell pepper, green bell pepper and diced chicken breast. 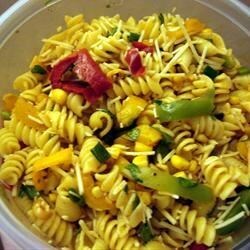 Combine with the chilled pasta mixture and cover and refrigerate for at least 8 hours or overnight before serving.